Made some progress. Nice sunday hacking. Got a new Toy. It’s a Juicebox from Mattel, a kids video and mp3 player. Actually it’s a linux based and has Samsung S3C44B0 ARM CPU, 8MB Flash and 2MB Ram. Since it has JTAG Pinouts you can use it as a really cheap ARM Dev Board. You can’t get one for around $10 at ebay. You find a lot of good info here. Made some LCD test stuff, a 3d starfield and a simple fire demo. This code runs directly on the hardware not on top of the build-in linux. You need a JTAG cable to download the code directly into the RAM. Got my Nokia 6100 LCD working. Long story of failures. First try was a LCD with a Epson controller from ebay for 10 Euros. 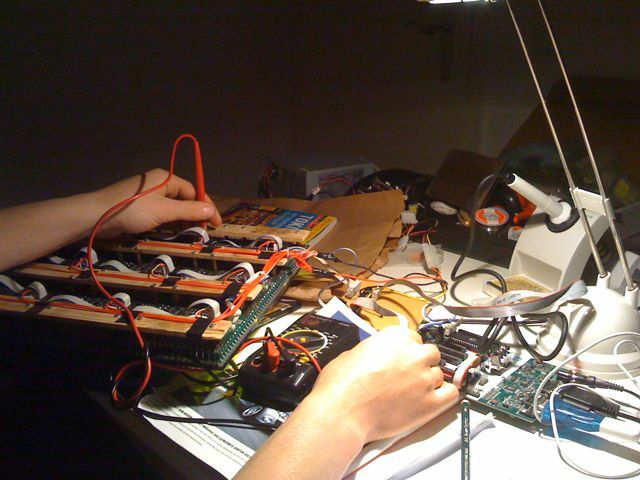 But somehow someone failed to solder the smd socket proberly and it went a way 😉 ( thx max ) . 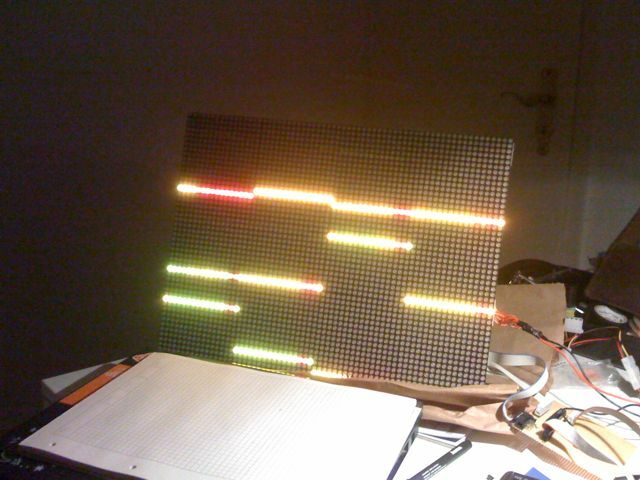 Next try was a Epson based LCD including a header board from sparkfun . 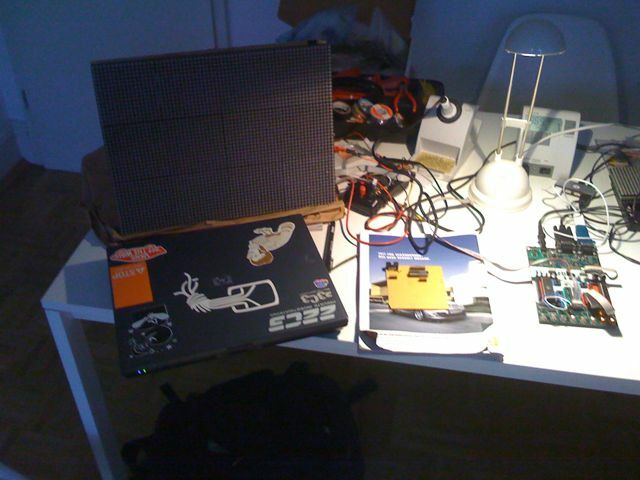 But this time i wasn’t able to run some demo code which was made for the LPC2138 on my LPC2148. I think the board was to fast to talk to the display. I wasn’t able set up SPI on the LPC2148 correct. Need more investigation on that topic. 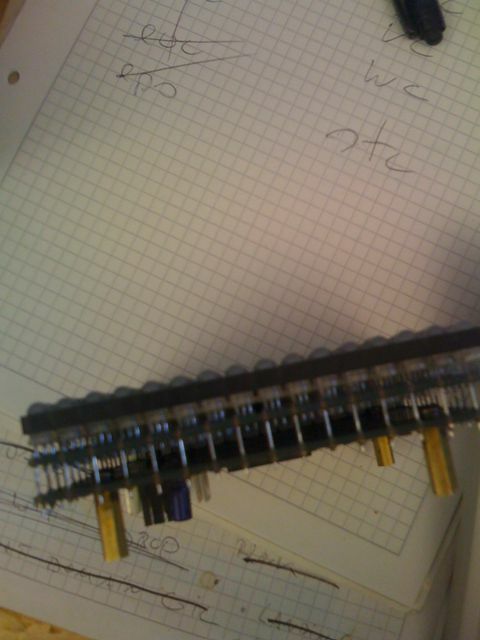 So i gave up at this point and decided to go for a atmega16. 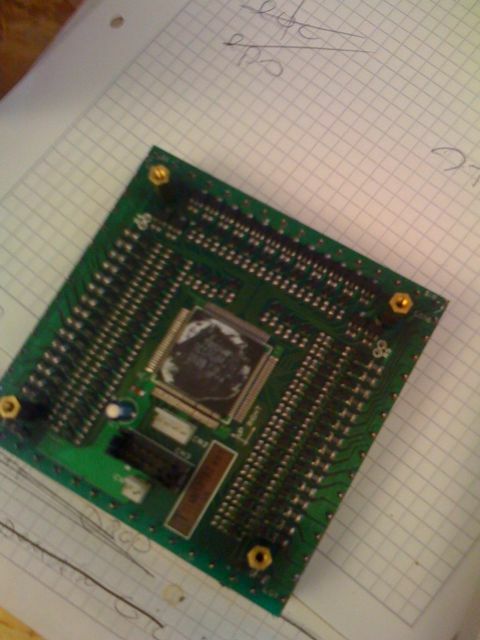 I did a devel board for that which is losy based on this schematics. 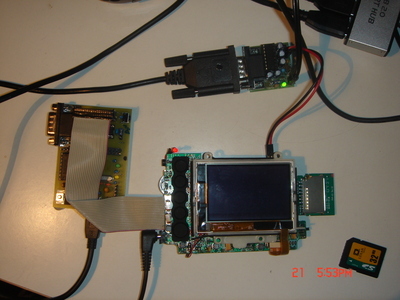 The boads uses simple parport icsp and has a serial line for debugging and sending data. 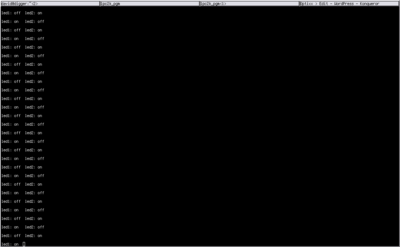 Finally i threw some code together using the init commands found in this project. 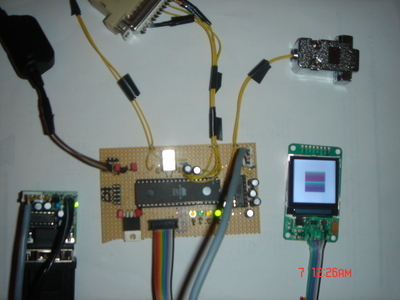 Added support for receiving images via uart and wrote an little python client for sending images. 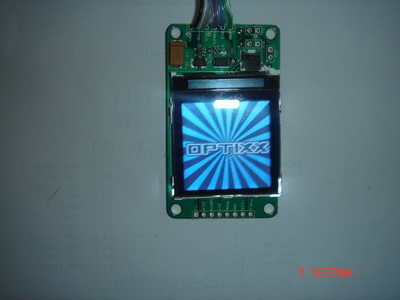 Future plans are to port the glcd lib to the epson based lcd. 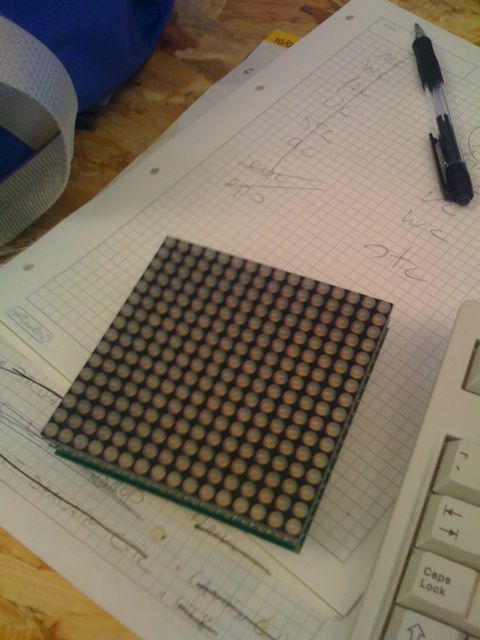 Found a LPC2138 port of the Embedded Filesystems Library. Took this stuff and made this working on my LPC2148. Now i can access an SD-Card attached to the LPC2148. Currently the FAT filesystem is supported. The sample pgramm includes an minimal serial line shell which supports file reading and directoy listings. I put together a small overview how to get things working using a linux host system. I use a standard arm GNU toolchain. 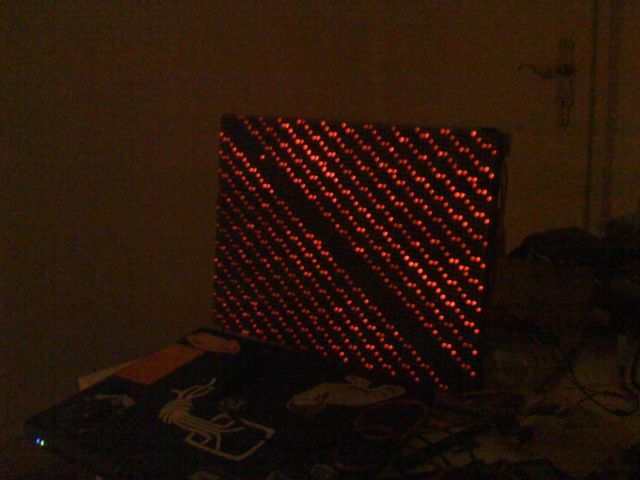 Actuallay found this binary download from mikrocontroller.net. But also my GBA Toolchain worked and produced good binaries. So a Gentoo ARM Crossdev should to the work. Think that the LPC is not too picky about that. I tried lpc21isp but it didn’t work for me. So i ended up using lpc2k_pgm. 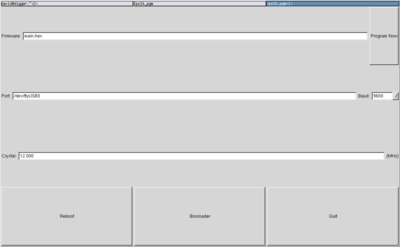 It has little gui and where you can setup all needed configs. 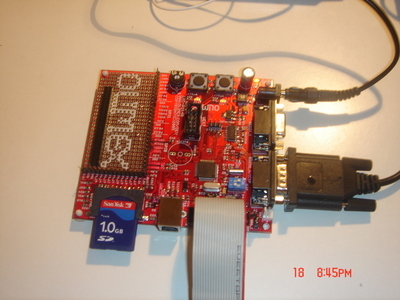 I use iHex format to upload to the dev board, where i had best results using quite slow sio speed like 9600bps. You have to enable BSL on the LPC2148 for ICSP. On my LPC the switch is called ‘ICSP1’ which needs to be set into ON position. Nothing special about that. Took it from similar LPC based projects.Just setup stack sizes and default IRQ vectors. Worked out of the box. Tooks this from a other LPC project. The script specifies the memory layout of the target system and defines the sections for the binary output. Code found in startup.c does the PLL init. The LPC2148 has 12 Mhz internal crystal but can run up to 60Mhz when setting the PLL. Also the default IRQ Handlers are defined here. I used the on-board leds for a simple IO test. Addes a little module that uses one of the two serial line for debugging output. I use the same serial port as for for the ICSP, so after the flashing lpc2k_gpm will display the output directly without any setup changes.